Many industrial wastewaters, particularly those associated with mining and mineral processing, contain high concentrations of sulfate. These concentrations typically exceed the secondary drinking water standard of 250 mg/L and may be subject to discharge limits between 250 and 2000 mg/L. A minimal volume of hazardous solid waste. Calcium sulfate, which hydrates to become the common mineral gypsum, has a solubility of approximately 2000 mg/L as sulfate. Sulfate reduction below 2000 mg/L has been possible in the past only through expensive technologies such as reverse osmosis (RO) or ion exchange (IX). Large volumes of liquid waste are generated with RO and IX, which typically create additional treatment and disposal costs. The CESR process can reduce the sulfate concentration in most wastewaters to less than 100 mg/L through use of a proprietary powdered reagent. Addition of the CESR reagent to lime-treated water precipitates sulfate as a nearly insoluble calcium-alumina-sulfate compound known as ettringite. Ettringite formation can also provide a polishing effect, allowing precipitation of difficult-to-remove metals such as chromium, arsenic, selenium and cadmium, often below their respective analytical detection limits. Boron, fluoride and up to 30 percent of the chloride and nitrate in water have also been removed. Metals and other constituents which the ettringite removes are typically not leachable, allowing disposal as a nonhazardous waste. The CESR process uses a sequential design to separate any metal hydroxide sludges from the other precipitates. The CESR process is an extension of wastewater treatment with lime in that it can meet more stringent requirements for sulfate removal. Lime is inexpensive, readily available and produces stable products which can be reused or disposed in landfills. Unlike treatment methods such as sodium aluminate addition, all of the chemicals added during the CESR process can be precipitated. Water treated by the CESR process typically meets or exceeds recommended drinking water standards for sulfate, metals and other parameters. The process produces a net reduction in total dissolved solids (TDS). 4.	pH reduction using recarbonation. Figure 1 shows the simplest version of the process where only final sulfate removal is required. Only Steps 3 and 4 of the CESR process are shown. The CESR process can be added to an existing wastewater treatment plant, and designed as a fully automated continuous process or a manual batch system. Separate mixing and settling tanks may be used, or equipment such as a lime-softening clarifier could be used to combine mixing and settling. For wastewater with a high metals content and a sulfate concentration greater than 8000 mg/L, hydrated lime is used initially to precipitate most of the sulfate as gypsum. This precipitation occurs at a pH below which the metals will precipitate. Over 80 percent of the sulfate in many wastewaters can be precipitated prior to metals precipitation in order to minimize the volume of hazardous sludge. A mixing time of 40 to 60 minutes is adequate for initial sulfate precipitation. The sulfate content of the wastewater can be lowered to 4000 to 5000 mg/L, with the resulting gypsum easily dewatered in a filter or belt press. Approximately 1.8 pounds of gypsum are precipitated per pound of sulfate. Since this is pure gypsum, no special handling or disposal permits are required. Wastewater with an initial sulfate concentration below 8000 mg/L, or which has already been treated using gypsum precipitation, is adjusted to a pH of 10.5 with hydrated lime. This removes metals as hydroxides and precipitates more gypsum, so approximately 2000 mg/L of sulfate remains in solution. As with the initial sulfate precipitation step, a mixing time of 40 to 60 minutes is adequate. This sludge is dewatered separately in a filter press to prevent contamination of the pure gypsum or ettringite. In a typical metal-bearing wastewater, approximately 45 pounds of gypsum and metals sludge are produced per 1000 gallons of water treated. The next step of the process is removal of sulfate to the desired concentration. The wastewater pH is increased to approximately 11.5 with hydrated lime. At this stage, the proprietary reagent is dosed at the rate of approximately one pound of reagent per pound of sulfate. The reagent combines with soluble sulfate to form an ettringite precipitate. During ettringite precipitation, contaminants such as nitrate, chloride, fluoride, boron and metals may be incorporated into its structure. Insoluble gypsum will interfere with this reaction if not removed in a previous step. This sulfate removal takes 30 to 300 minutes, depending on the amount of reagent added, level of removal required and other ions in the water. Ettringite sludge is easily dewatered, and may be reused in the process as seed sludge to reduce the quantity of coagulant required. It is often necessary to lower the effluent pH to meet discharge criteria. If treated water is to be reused in the plant, the pH should be reduced to prevent deposition of hard carbonate scale on filters and distribution piping. Recarbonation (addition of carbon dioxide) is the process typically used for pH reduction. Approximately 2 pounds of CO2 are required per 1000 gallons of water for reduction to pH 8.5. This reduction yields approximately 4 pounds of calcium carbonate and aluminum hydroxide sludge per 1000 gallons of treated water. For discharge to surface water or a POTW, it may not be necessary to remove this sludge in a clarifier, because of the small amount and its benign nature. This process has been successfully used for several years in numerous European plants in various industries, and its application is being expanded to the United States and Canada, South America and other markets. In bench tests over the past several years, concentration targets for sulfate and metals were consistently met for approximately 50 industrial wastewaters of varying compositions. The results achieved were typically well below applicable water quality limits; in some cases, drinking water standards were met. Hydrometrics recently performed several sets of bench tests using mining and metallurgical wastewaters. These test results are shown for selected case studies. Acid rock drainage from the Berkeley Pit in Butte, Montana was tested to find an efficient method for sulfate removal. Sulfate concentrations as low as 4 mg/L were obtained in treated water, with higher concentrations measured when using lower reagent dosages and/or shorter residence times (Table 1). Concentrations of metals analyzed were below their respective analytical detection limits in many instances. Water from a closed gold mine in Montana was also tested in CESR-process bench tests. In reducing the sulfate concentration to approximately 30 mg/L, the total dissolved solids (TDS) concentration of this water was reduced from approximately 4400 mg/L to 1400 mg/L (Table 2). Effluent concentrations of antimony and arsenic were below the analytical detection limits, and concentrations of constituents such as selenium, thallium and nitrate were also significantly reduced. In bench tests using wastewater from a metallurgical plant, sulfate concentrations were as low as 190 mg/L, compared to the original concentration of 29,100 mg/L (Table 3). All of the most stringent discharge limits for this application, except TDS and SC, were met. Concentrations in bold exceed discharge limits. Other water quality parameters (e.g., sodium and chloride concentrations). Operating costs are typically $3 to $6 per 1000 gallons treated for removal of sulfate to low levels, with most of this due to reagent consumption. For example, the reagent cost would be approximately $3 per 1000 gallons for removal of 1500 mg/L of sulfate. This portion of the operating cost is directly related to the sulfate concentration to be removed. If less sulfate needs to be removed, operating costs will be lower. The total operating cost is less then the cost of competitive technologies such as reverse osmosis (RO) and ion exchange (IX), primarily because the CESR process does not generate a liquid waste stream. RO and IX processes for wastewaters containing a high sulfate concentration incur high capital and operating costs because a relatively large percentage of the flow becomes a liquid waste stream, which typically must be evaporated. The CESR process is a cost-effective alternative for sulfate removal. In the Cost-Effective Sulfate Removal (CESR) process used by Hydrometrics, a proprietary reagent is added after standard lime treatment to precipitate a compound called ettringite, which can be removed using a clarifier and filter press. Sulfate, heavy metals and other contaminants may be removed in the process, which generates no liquid waste. Sulfate concentrations lower than 100 mg/L are typically achieved using this process, with the final concentration dependent upon the reagent dosage and residence time. 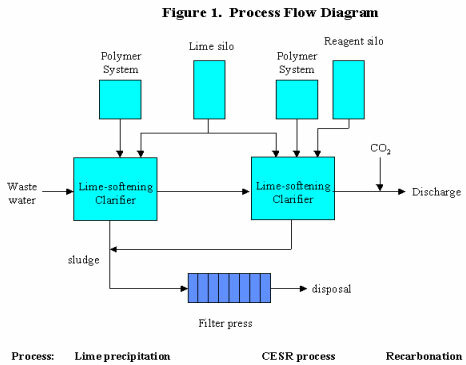 The CESR process is simpler and less expensive than other sulfate-removal technologies such as reverse osmosis, ion exchange or sodium aluminate addition, and is more effective than standard lime precipitation. This process is a true reduction of total dissolved solids (TDS) in that all chemicals added for treatment are precipitated during the reactions. Operating costs for near-complete sulfate removal using the process, which has been demonstrated successfully for many industrial waters, are estimated at $3 to $6 per 1000 gallons treated. Hydrometrics, Inc., 2727 Airport Road, Helena, MT 59601. Tel: 406-443-4150; Fax: 406-443-0760.